Shopping for Sherlock Holmes Action Figures? I say, is Mr. Sherlock Holmes at home? 221 Baker Street, home to Holmes and Dr. Watson! Diorama features a movable door knocker, an opening letterbox, and realistic metal railings. The internal lamp lights up behind the window! 21-inches tall, it's a limited edition of only 1,000 pieces worldwide. The address of 221B Baker Street is home to the world's only consulting detective - Sherlock Holmes. 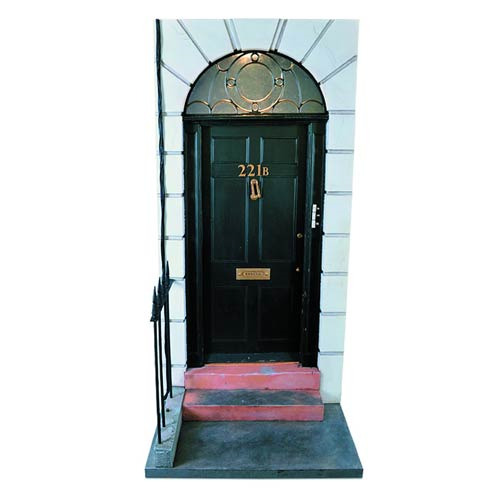 Behind the black door of this unassuming flat on a regular street, Sherlock and Dr. John Watson can be found working on solving their latest case. Big Chief Studios presents the Sherlock 221B Baker Street Entrance 1:6 Scale Diorama. With a movable door knocker, an opening letterbox, realistic metal railings, and an internal lamp that lights up behind the window, this marvelous item is the perfect set piece to display your Sherlock Holmes and Dr. Watson 1:6 scale collector figures (sold separately)! It stands over 21-inches tall and is a limited edition of only 1,000 pieces worldwide. Countless hours of research went into the creation of this diorama. Detailed measurements were recorded for every stone, every panel of the door, the doorsteps, and the railings.